Car saleswoman shows a young couple information about their new car. Successful couple buys a new auto at a prestigious car dealership. Successful couple buys a new auto at a prestigious car dealership. Car saleswoman shows a young couple information about their new car. Car saleswoman shows a young couple information about luxury car in expensive car showroom. Successful couple buys a new auto at a prestigious car dealership. 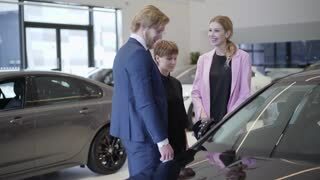 Car saleswoman shows a young couple their new car. A successful couple buys a new auto at a prestigious car dealership. Bearded salesman in a business suit tells two successful young girls information about a new auto at a car dealership. Car showroom. Handsome bearded salesman in a business suit tells two successful young girls information about a new auto at a car dealership. Car showroom. Car saleswoman shows on a tablet a man information about their new car. Car dealership. Young happy family concludes an agreement on the purchase of a new vehicle. Car dealer in a stylish suit shows information about their new car on the tablet to young successful couple. Car dealership. Car dealer in a stylish suit shows information about their new car on the tablet to young successful couple. Car dealership. 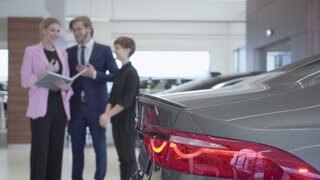 Unrecognized car dealer in a stylish suit shows information about their new car on the tablet to young successful couple. Car dealership. Motor car. A confident beautiful woman seller holding a catalog with cars and their characteristics provides a young successful business couple with information about a new vehicle. Car dealership.